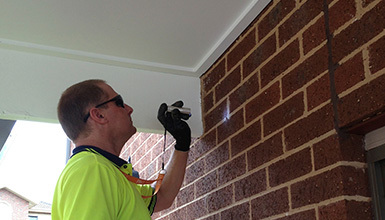 Insulating new homes in Australia with spray polyurethane foam (SPF) is becoming more and more common place. Due to ever increasing demand for this type of insulation, we recently invested in a new spray gun and scarﬁng tool to decrease our installation and clean up time. 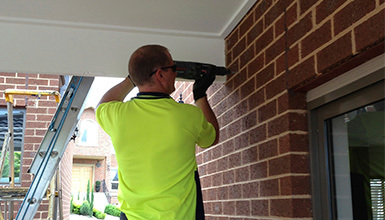 The result for you is a more cost effective installation. We often get asked if we can insulate existing walls, ﬂoors, ceilings, under roofs and between ﬂoors. 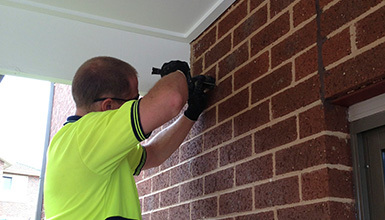 We have foams and methods to achieve this with brick veneer, double brick and weatherboard homes. 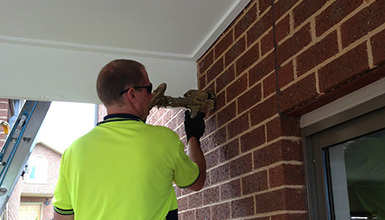 Installing polyurethane foam into an existing brick veneer wall is not without its risks. The methods we use and the products applied help minimise the risk of popping the plasterboard off the studs. Unfortunately there is always a chance of this happening due to the inability to know exactly how the plaster was installed in the ﬁrst place, or if there are holes through the sarking (building wrap). The installation method used a slow and careful process. First the walls are drilled using a speciﬁc hole pattern which is determined by the layout of windows and doors etc. A metered amount of slow reacting SPF is injected into the cavity. The foam is watched to ensure it is rising past the injection point. The hole is then plugged. To receive a quote for a new or existing home, please CLICK HERE.